Browntone silver photograph portrait of Burroughs, inscribed and signed on the image in ink, "To Maud Gilbert, with best wishes, Edgar Rice Burroughs." Ink signature of the photographer, W.F. Seeley, in lower right corner. 10x8, affixed to map with tape at the top on the verso, framed and glazed. 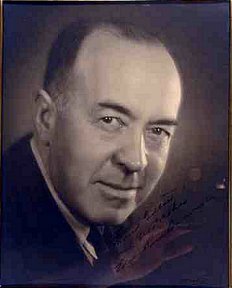 Formal studio portrait of Edgar Rice Burroughs inscribed to his mother-in-law Maud Gilbert, who was the mother of Florence Gilbert Burroughs, and also of Ed Gilbert. Photo Service, or Kopec; most with typed label on the reverse, "Return to: Edgar Rice Burroughs, Inc. Tarzana, Reseda, California." Splendid photographs of the lands which were to become, in the words of Irwin Porges (Edgar Rice Burroughs, The Man Who Created Tarzan), "the most ambitious of his [ERB's] business projects." 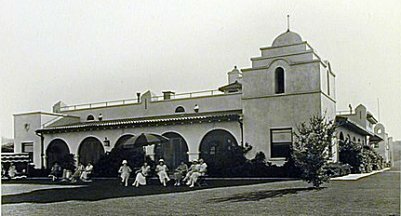 Burroughs planned to sell 120 acres of the Tarzana Ranch, including the large house and other buildings, for a country club. In a letter to his brother Harry, January 18, 1934, he wrote "It is to be called El Caballero Country Club, and the aim of the promoters is to make it the finest and most exclusive country club on the Pacific coast. There will be two golf courses and a polo field. Our residence will be used as the nucleus of a larger club house." The project, one more in series of schemes by Burroughs to raise capital by selling portions of his Tarzana Ranch, was doomed to failure. In 1930 ERB foreclosed on the foundering club, and afer five years of peregrination, got back his large, stately house. This small photograph album was evidently produced in the early promotional stages, with views of the grand mission-style house on the hill, the large pool, lands slated for development into a 19-hole golf course, riding trails, etc., including two striking panoramas of the sparsely settled areas. from Tarzan movies Stills from various Tarzan movies, from the 1920 "The Revenge of Tarzan" starring Gene Pollard, to Ron Ely as Tarzan in the 1966 NBC television program "Tarzan." Most with credits or captions on the reverse. Approx. 8x10 or reverse. Besides Gene Pollard and Ron Ely, there is Frank Merrill, Gordon Scott, Johnny Weismuller, Glen Morris and others and the Lord of the Jungle. A few with marginal production markings and other wear, else very good or better. Ten vintage stills from Tarzan movies Each approx. 8x10 or reverse, some with marginal production markings, credits on the reverse, etc. Includes two of Elmo Lincoln, the first movie Tarzan (Tarzan of the Apes, 1918), which are later copy photographs; Herman Brix in the 1935 serial The New Adventures of Tarzan; Johnny Weismuller and Maureen O'Sullivan in Tarzan the Ape Man, 1934, and Tarzan Escapes, 1936 (but stills are from 1954 re-releases); James H. Pierce in Tarzan and the Golden Lion, 1927 (he was ERB's son-in-law); two of Ron Ely, the first TV Tarzan (NBC, 1956); and others, including the legendary bomb, Tarzan, the Ape Man, starring Denny Miller, 1959. Generally very good, a few better. 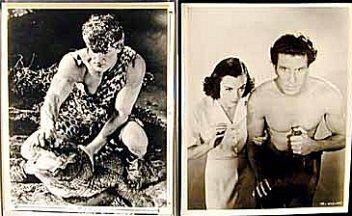 Two vintage photographic stills from Tarzan movies Buster Crabbe as Tarzan, with Cheetah whispering in his ear, from the 1933 production of "Tarzan, the Fearless"; and Johnny Weissmuller as Tarzan, and Johnny Sheffield as Boy, both hanging from a limb, from the 1939 production of "Tarzan Finds a Son." Each 10x8. Vintage stills featuring two of the more famous Tarzans. Each with original editing marks in the margins, credits and other markings on the reverse. First with corner chips, else very good, second better. on the set of Tarzan the Ape Man Vintage sepia-tone silver photographs of Edgar Rice Burroughs (in suite, tie and overcoat, wearing a hat), Johnny Weismuller (in loincloth), and director W.S. Van Dyke on the set of the 1932 movie "Tarzan the Ape Man," the first Tarzan movie to star Weismuller. 10x½. 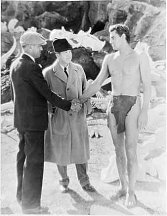 Burroughs is introducing the famous swimming star to the director who will guide him in his most famous role, that of the vine-swinging Tarzan. On the verso is the rubberstamp of the N.Y. Times Book Review, a typed label which is taped and annotated, rubberstamped date May 7, 1932, and several other notations including the New York address of Robert Fenton. Some creasing and minor fading, else very good. Burroughs at his desk, with small elephants strung along the top (with rubberstamp of Tarzana photographer Johnny Corbin on the reverse); Burroughs in uniform when he was a correspondent during the Second World War; Burroughs seated comfortably at his desk talking on the telephone, cigaret in hand; and portraits of Major George Tyler Burroughs and Mary Evaline Burroughs, on one sheet. 8x10 Burroughs at work and in the military, with his parents thrown in. The Corbin photograph creased, that of ERB's parents with a paperclip mark, generally very good. by his son Hulbert Burroughs ERB wearing a double-breasted suit and tie, laughing (7½x7½), captioned in ink on the reverse "Edgar Rice Burroughs, 1940's"; and ERB in casual, open-necked shirt, his arm around the shoulders of a man in shirt and tie (8x10). Both with rubberstamp "Photographed by Hulbert Burroughs" on the reverse. The prolific writer captured in candid, informal moments by his eldest son, an accomplished photographer. First with some creasing, else both very good. 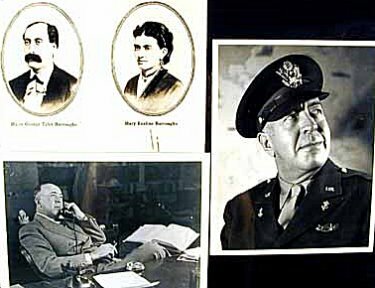 Two vintage silver photographs of ERB, Barker and others on the set of the 1949 motion picture. One the ink description on the reverse along with rubberstamp of The Burroughs Bulletin, Kansas City, MO; the other with pencil caption on the reverse. 8x10. Edgar Rice Burroughs in his last public appearance. 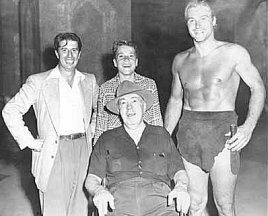 The four people in the first photograph are "Vern Coriell, Mike Pierce ERB's Grandson, Lex Barker and Edgar Rice Burroughs on set of Tarzan & the Slave Girl. One of the last pix taken of ERB before his death, and his last public appearance." The second photograph shows Barker, the seated Burroughs and an unidentified man. The first with publication markings in the margin. Both near fine to fine.